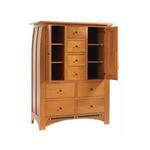 Our Amish Vineyard Chifforobe Chests are handcrafted by highly experienced Amish craftsman in the United States. Held to the highest standards of craftsmanship and intended to become heirlooms, these chests are crafted with the highest quality in mind and we hope they will be with you and your family for generations! The multiple drawers and added storage space in these chests will help keep your clothes and linens organized while also adding balance and charm to your master or guest bedroom decor! 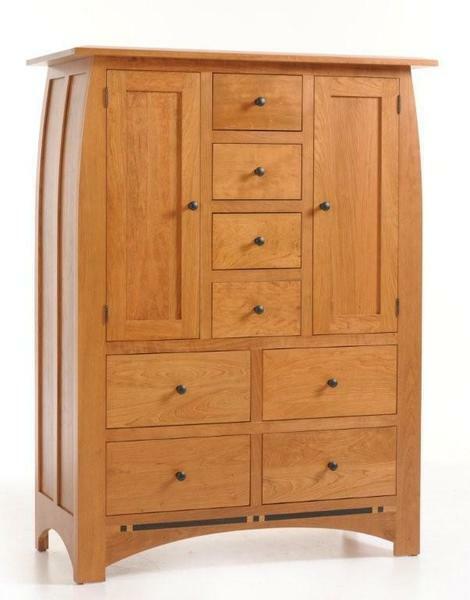 Each Vineyard Chifforobe Chests is Amish-handcrafted using Old World Craftsmanship techniques. Hard wood is hand selected for character and longevity, and no two chifforobes are exactly the same! A brief history: The Chifforobe was first mentioned in the early 1900s in a Sears and Roebuck Catalog; however, it has been said that Mule Chests and Chifforobes originated in medieval Europe in the homes of nobility! The Mule Chest and Chifforobes tend to be more prevalent and popular in the Southern portion of the United States. Both closet like Chests are usually tall and large to offer plenty of drawers and hanging space. They are ideal for homes that have limited closed space. Both the Mule Chest and Chifforobe are primarily used in bedrooms however will often be found in hallways, storage rooms for linen and coat storage, dorm rooms and classrooms.